The acclaimed essay from Creative Nonfiction magazine’s “Mexican Voices” issue read by the author. Single track, time approximately 35 minutes. C.M. 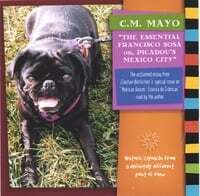 Mayo unearths hidden side of a storied neighborhood as she personally reads her lively account of a stroll through Coyoacán with her pug. “The Essential Francisco Sosa or, Picadou’s Mexico City” is a warm, witty and inviting traveling companion for an intimate journey through a vibrant, richly patterned historic neighborhood of that megalopolis, Mexico City. Innovative and informative, the audio version of Mayo’s award winning essay delights the imagination and inspires listeners to take a closer look at their own surroundings while offering a captivating peek into a world that revels in both the exotic and the everyday. Walking, I am sure my little black pug Picadou would agree, is the essential part of our day. If Picadou could talk, I think she would say that grass is nice, but smells and particular individuals, both human and canine, their habits and whereabouts (or nowhereabouts) are the most interesting, and so when we go for our afternoon walk down the Avenida Francisco Sosa, which has tall trees whose branches hold hands across the street, we don’t mind the lack of grass. But first we have to hurry down our own narrow street. Beneath the canopy of bougainvillea and lavender wisteria, birds chuckle; a gecko slithers up a wall into ivy. Between the cobblestones, weeds and tufts of grass poke up; Picadou picks her way eagerly but carefully as a cat. In the length of a ball’s toss we’re in the alleyway of Montecristo, aiming straight at the Avenida Francisco Sosa. Most of Montecristo is spanned by the jail-high wall of the pumpkin colored house that was listed by Sotheby’s for several million dollars but took as many years to sell and I suspect at a much lower price than was asked because, after all, its front door is on an alleyway. Here the sidewalk is only two flagstones wide and traffic barrels past fast over the jumbled stones, car after car, the chassis’s creaking and tires bumping. Picadou does not like me to, but I pick her up and carry her. To avoid the lamp post, I have to step down into the street; then, after waiting for that VW van to rattle past, I step down again to go around a smashed beer bottle. There goes the Domino’s Pizza delivery scooter: put put put. Once on the Avenida Francisco Sosa, we do not turn right and visit Ingrid, who is blonde and from Sweden and has a lipstick red chair at her desk in her L’Arlequín shop, because she has that Akita. He lies there among the pottery lamps and pewter trays quiet as a rolled-up rug, but his ears are always pricked. Once, Ingrid told me, years ago when she had her other Akita, a man slipped in and held a knife to her throat and the Akita attacked him. If we were to turn right and trot past Ingrid’s shop (very quickly), in another block we would come to the house of the conquistador Pedro de Alvarado. Lately this house is the headquarters of the Octavio Paz Foundation, but Picadou is not allowed into the bookshop nor into the garden with its burbling fountain and sweet-smelling orange trees, and so (Picadou has decided) we bear left. Picadou, who is in her pink halter, pulls hard. She may be tiny enough to snooze on my lap while I work, but she is a solidly muscled sixteen pounds of willful pug. Multo in parvum, a lot of dog in a small package, is the motto of the breed. Before Picadou, I had two brother pugs, Foo and Ti, who, bless their souls, lived long enough to go lame and blind and deaf, but when they were young, Ti, in a flying rage at the sound of the doorbell, busted the hall door off its hinges. In short, behind my pug, I trot along, and briskly. Already, here where we come onto it from Montecristo, we are nearly a third of the way down the nearly mile long Avenida Francisco Sosa. It begins a few blocks beyond Ingrid and her Akita at the baroque gem of a chapel called Panzacola and it ends (a straight shot east) where we will arrive in about fifteen minutes: the bustling main plaza of El Jardín del Centenario. A broad, one-way street paved with oyster-gray cement bricks, Francisco Sosa is the main artery of historic Coyoacán, which nestles within the borough of the same name. Coyoacán, in Nahuátl, “The Place of Those Who Keep Coyotes,” is in the south of Mexico City. With its twenty-plus million inhabitants, this megalopolis we live in may well be the largest in the world, the “Super-Calcutta,” as Carlos Monsiváis lampoons it, “the post-apocalyptic city” and “the laboratory of the extinction of the species.” Not that Picadou would care a snuffle about any of that. Here, on Francisco Sosa, its feels refreshingly green and scaled down to a walkable coziness. Most of its buildings date from the eighteenth century, and as is the style in Spanish Granada and Córdova, their high walls edge right up to the street, the roofs flat and windows resolutely barred, though with touches of New World color: papaya, pink, ocean-blue, and all spangled with the graytinged light that falls through the trees. Gardens and patios are hidden from street view, though yellow and purple bougainvillea spill over an adobe wall, and here and there peeks the wiggy head of a palm tree. Where the walls make corners into doors with their high mounted video cameras, there are urgently fascinating smells that Picadou must stop to sniff.